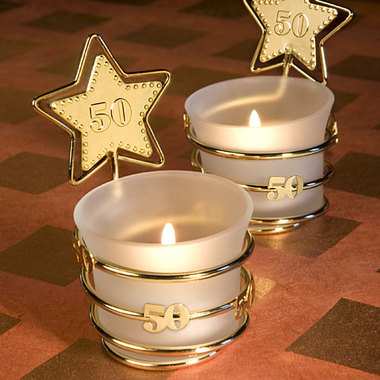 These golden anniversary party favor votive holders will help to set the celebratory mood for your event! Once lit the room will be aglow with warmth and good cheer. These favors for a 50th anniversary party measures 3" x 2". They have a frosted white glass candle holder with a white votive candle inside resting in a gold metal coiled wire base. The base's coil wraps around the holder with "50" enhancements and rises up to form a star shape with a beaded star design "50" charm at its center. Each candle comes individually packaged in a white box.